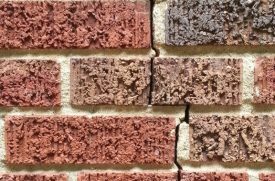 The foundations of residential homes and commercial buildings have undergone nothing short of a repair revolution in recent years, though most consumers and businesses still take an “out of sight, out of mind” approach. Nowhere is this significant development more visible than in the use of helical pilings, hydraulically driven piles that are used to provide support and stabilization for structures that have experienced a shifting and unstable foundation.. Helical piles are extremely effective and can be quickly installed with small equipment regardless of weather conditions. When faced with unstable soil types, the helical piles are used to transfer loads to a layer of stable load-bearing soil. Carolina Foundation Solutions (CFS) utilizes CHANCE Helical Underpinning Piles, the industry standard since 1912. 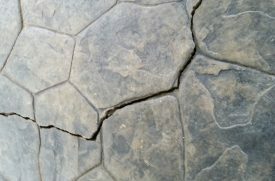 Carolina Foundation Solutions has provided assessments and foundation repairs for more than 17 years. 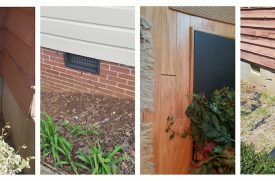 They are also the premier CHANCE installer in the Carolinas. Their services begin with a complimentary meeting with a technical consultant who obtains important background information concerning the property’s age, ownership specifics, existing issues and historic structural changes inside and outside the building. 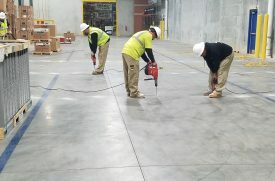 The CHANCE-certified consultant then conducts a comprehensive physical assessment of the property, evaluating any cracks, gaps, or separation that may exist within the concrete, brickwork, walls or floors. CHANCE helical piles are the most commonly used system in the foundation repair industry. Made in America from recycled steel, the CHANCE helical piles are also the most environmentally sustainable solution. CFS installs CHANCE helical products that consist of hot-dipped galvanized steel exclusively, a material that is considered universally superior, having been tested over decades, in all soil conditions such as expansive soils, fill material and those soils affected by a highwater table. Soil is also the primary corrosive agent, causing an electrochemical reaction that gradually degrades steel and other metals. The subsequent material loss leads to a reduction in thickness and area of the supporting piles. Traditional steel helical piles are vulnerable to corrosion, as well as to other agents, such as moist clays, dry silts and loams, sand and gravel. In fact, a steel helical pile can last just 55-years when set against these materials. In contrast, a hot-dipped galvanized steel with a zinc coating helical pile has a service life of 140-years. Though corrosion levels vary greatly based on soil and other environmental conditions, there is no doubt installing a pile that lasts three times as long is the most efficient and economical decision. Quality control is also unparalleled by rival solutions, given the field-measurable torque system that allows for perfect adjustment of the hot-dipped galvanized recycled steel fabricated in the U.S.A. 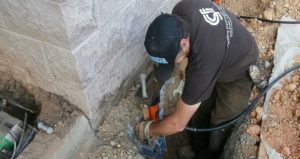 The same CHANCE helical piles that are used for repairs to foundations of residential and commercial structures are also utilized, for anchoring major gas and petroleum product pipelines, providing lateral support for existing retaining walls, as foundation systems for boardwalks and as deep foundation systems for new construction projects. Carolina Foundation Solutions only utilizes ICC-ES certified piles from CHANCE. The ICC-ES evaluation service is a precision-based test of building materials. The certification process concludes with extensive technical reports to address building code compliance directly. This process provides residential and commercial customers with the confidence they are installing the highest quality materials to secure what arguably is the most important component of construction. Repairing a settling or shifting foundation is an essential requirement of home and commercial building ownership. Fortunately, the massive obligation of historical foundation work has, in most scenarios, been replaced by effective helical piles. 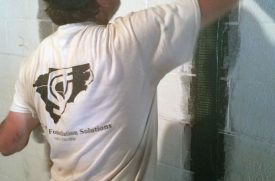 Carolina Foundation Solutions provides comprehensive services to make sure, as home and business owners, we can rest assured knowing we’ve hired the finest foundation repair company in the region and using the best materials on the market to repair our foundation.